This the game NFL fans have been waiting for. 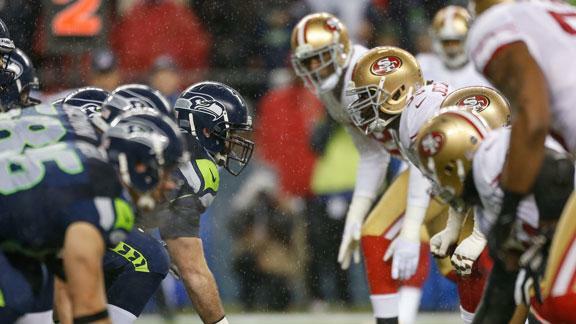 When the offseason rolled around, there was a major anticipation for the 49ers and Seahawks to meet again. Their first of two meetings (and possibly three) is tonight in Seattle on prime time. The rivalry has grabbed the attention of everyone in the NFL world. It has become the premiere rivalry. No longer is the hard-nosed defensive battle between the Ravens and Steelers the talk of football. We have the showdown out West that’s worth our attention. What first attracted people to this rivalry was that these two teams now are considered to be in the elite of the NFL, both having made the playoffs last season. Adding to the fact that both of these teams are division rivals, it just adds more to every matchup these two encounter. Last season was our first glimpse of what could be from these two teams and now this season, we are ready to get what we hope would be football at its best. The first major intrigue from last season most people took notice was the quarterback play from both teams. Russell Wilson and Colin Kaepernick are now the future of the NFL. Both these quarterbacks present us with a dynamic style that’s changing the NFL. Both have great arms, great mobility and the fact that they are both young stars really give great optimism for the future of the league. The read option style that’s now the fad in the NFL can be partially attributed to these two quarterbacks. The future of the league is with these two quarterbacks. But what makes this rivalry great is the defense. Both teams feature tremendous Pro Bowl defenders. The 49ers have great pass rushers and run stoppers with Aldon Smith and Justin Smith leading the way. The Seahawks have a tremendous secondary, led by ballhawks Richard Sherman and Earl Thomas. Both these defenses are what the old school football fan must love. The battle in the trenches is what the 49ers and Seahawks are built on and it will be fun to see how these familiar foes match up. Alongside with a tough defense, both teams boast tremendous running attacks. Frank Gore and Marshawn Lynch are both downhill runners that give this a great smashmouth football feel. That’s always exciting to watch for football fans. There’s a certain hype that has followed this rivalry and it’s all worth it. These two teams are both considered serious Super Bowl contenders and play football with the same philosophy and mentality. It’s a great heavyweight battle tonight that fits what the old school and new school. It’s hip, fresh and happening with a good dosage of the classic smashmouth aggression. What’s not to love about this rivalry. It’s perfect for everybody. The wait is almost over. This entry was posted in NFL, San Francisco 49ers, Seattle Seahawks and tagged Rivalry. Bookmark the permalink.